ASABA—THE re-scheduled elections in Ughelli North and Ethiope East Local Government Areas of Delta State, conducted by the delta State Independent Electoral Commission, DSIEC, held under tight security yesterday, witnessed low turnout of voters in both councils. Despite the restriction on movement from 6a.m., to 3p.m., by the police, residents of major towns such as Ughelli, Kokori and Abraka, went about their daily activities, not bothering to go to vote. The All Progressives Congress, APC, in the state had, less than 24 hours to the commencement of the election, said the party was boycotting the polls and accused the state governor, Dr. Ifeanyi Okowa, of conniving with DSIEC to select chairmen and councillors as winners of the election. Describing the election as peaceful, former Minister of Niger Delta Affairs, Dr. Steve Oru, said: “Materials arrived early at my wards and units and after accreditation, voting commenced and the exercise was peaceful. 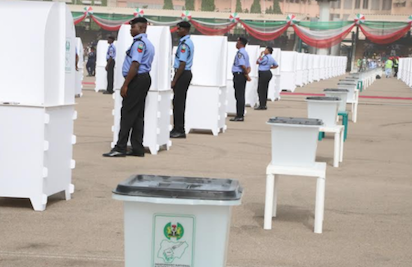 The post Rescheduled LG poll in Delta holds amidst tight security appeared first on Vanguard News.